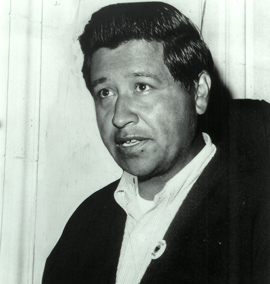 Caesar Chavez founded the United Farm Workers in 1962 and led the union until his death in 1993. He championed the rights of poor migrant and immigrant farm laborers. Chavez is best known for initiating a national boycott of table grapes to support his union's efforts to unionize the grape industry. Throughout the United States, people sympathetic to the grape pickers stopped buying table grapes in support of their efforts. Click on PICTURES below to see a photo of backbreaking work in the strawberry fields in 1996. Click on AV below to view a film about Chavez’s life work.